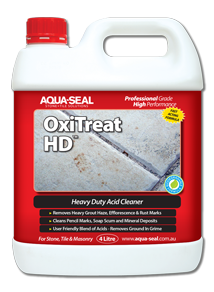 OxiTreat HD is a fast acting concentrated acid treatment utilising an AQS Heavy Duty formula to remove most cement & grout haze, efflorescence, rust stains, mineral deposits, mortar residue & smears. Will help remove most hard water stains, lime deposits, soap scum and ground in dirt and grime. It will also etch concrete. USE: On ACID RESISTANT surfaces. Use when surface temperature is between 4°C and 32°C.5. Take care when using on dark coloured grout or on natural stone. After removing efflorescence, treat area with Eff-Ective to help minimise and manage future efflorescence. 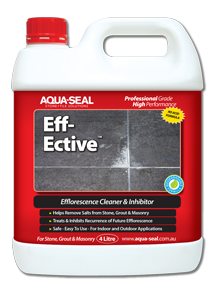 Eff-Ective is a non-acidic efflorescence cleaner & inhibitor. Formulated with New Generation AQS Technology to treat and help inhibit future efflorescence. USE: For concrete, grout, masonry, pavers, terracotta, terrazzo and natural stone. Use in Indoor, Outdoor, Domestic & Commercial Area. Note B: If efflorescence is entrapped below a non-breathable sealer, follow directions of Problem Solver #11-Remove Sealers & Coatings to remove sealer prior to efflorescence removal.